Was The Ascension Story Manufactured? It is common knowledge that the four gospels were written years after Jesus allegedly walked the Earth, and that the writers were not the apostles Matthew, Mark, Luke or John who were with Jesus during his ministry. It also is known that Paul, who claims to have had a miraculous conversion after his single encounter with the spirit of Jesus while on the road to Damascus, is credited with scribbling much of the rest of the New Testament. Nobody knows for sure who wrote the Book of Acts. Scholars say the writing style is so similar they believe the author of Luke also wrote Acts. It is only in the first chapter of Acts that a description of the ascension of Jesus is described. There are vague references to it in the Gospels of Luke and Mark. Mark states: "And after He had said these things, He was lifted up while they were looking on, and a cloud received Him out of their sight." In Luke we find: "While He was blessing them, He parted from them and was carried up into heaven." Strangely, the Gospel of John, which is the only text that proclaims Jesus to be the Son of God, fails to mention this most important event, which would help prove the deity of Jesus. If all four gospels were written long after Jesus lived, by writers that never personally knew Jesus, then how can they clearly describe the ministry, the death, resurrection and ascension of Jesus? Research into the way the New Testament books were pulled together by priests of the Roman Catholic Church in 1557 reveals that a lot of time passed before this part of the Bible was finally put into words. And we should not be surprised that all of the ascension stories in the gospels were added late . . . an estimated four or five hundred years after the alleged event was said to have happened. So the big question is . 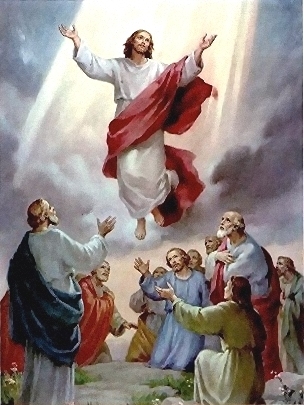 . . if all of the apostles and followers of Jesus were standing there watching as he was miraculously lifted up into the sky and disappeared into the clouds, why wasn’t that included in all of four of the gospels? Another problem: If the same author wrote the Gospel of Luke and the Book of Acts, why is the ascension story in conflict with itself? Luke seems to say that the ascension occurred very shortly after the resurrection. Acts says it was 40 days later. Which was it? "The problem with the Gospel of Mark for the final editors of the New Testament was that it was grossly deficient. First it is significantly shorter than the other Gospels . . . But more important is how Mark begins his Gospel and how he ends it. "He has no account of the virgin birth of Jesus – or for that matter, any birth of Jesus at all. In fact, Joseph, husband of Mary, is never mentioned in Mark’s Gospel at all – and Jesus is called a "son of Mary." But even more significant is Mark’s strange ending. He does not write about the appearance of Jesus following the visit of the women on Easter morning to the empty tomb!" Bible scholars generally assume that the other three gospels were merely expansions (and fabrications) based upon Mark’s Gospel. A lot of stuff was added to the story, thus making a deity of a man who was never what the church has claimed. And even Mark, while written early, was not penned by an eye-witness to the events in the story. The stories were all passed down to the writer by second and third hand observers. While Mark includes the crucifixion story, other writers of that period never mention it. And there is no mention of a resurrection and ascension. It appears these miraculous events were all manufactured to make a god out of a prophet who just had a darned good message for the world, and especially for the Jewish people of that day.